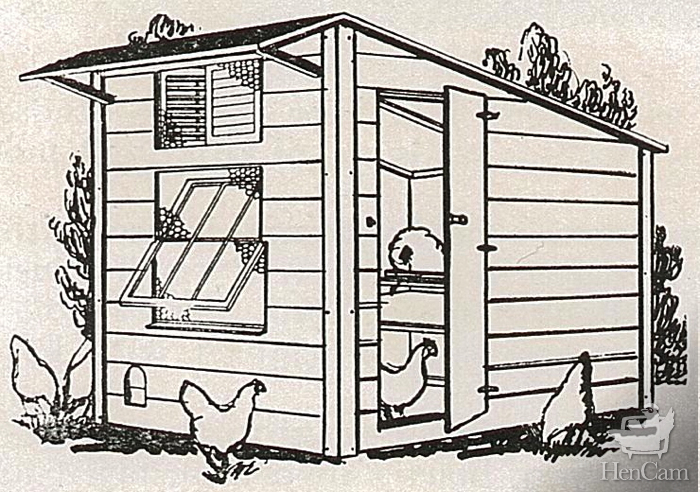 If you’re thinking about putting chickens your backyard, there’s a bewildering selection of prefab coops, building plans and advice out there. Unfortunately, many of the coops are poorly designed and are far too small for the number of birds that they advertise that they can house. There’s also been a plethora of “reinvented” coop ideas. I’m all for fun design, but not at the expense of thehealth of my hens. Interior floor space: A minimum of 4 square feet per chicken of interior floor space. This doesn’t count the nesting boxes (some coops have them on the floor) or the exterior covered run space. Interior air space: Chickens need to roost at least 30 inches up off of the ground, and have head space to do that comfortably. Roosts: 6 inches per hen. I prefer rounded roosts. Hens have special ligaments in their legs that lock in place when they sleep. This is how they can sleep without falling off the perch. To do this, they need to be on a round roost. Roosts should be at least 18-inches off of the floor to allow the hens to breathe clean and dry air while sleeping. If possible, have roosts at varying heights because that helps with flock dynamics. A ladder-style roost is best, so that the heavy hens can hop up and down. There should be head room above the top run to allow for air flow. Windows: Sunlight is essential in a coop. Hens have very poor night vision. Even if it’s daylight outside, if it’s dark in the coop, your chickens won’t get moving, eating, or laying their eggs if they can’t see to hop off of the roost. Also, sunshine is a natural sanitizer. And, the hens appreciate a sunny spot on a damp and cold day to sit in. Finally, windows allow you to look in, and sometimes you need to know what’s going on in the henhouse! Ventilation: Soffits in the eaves are not enough. A cupola is best, as it very effectively pulls damp air up and out. Vents near the eaves are good, but must be large enough. Windows that open when it is hot are a necessity. Pop door: This is the small door that the chickens use to go in and out. In cold weather, they can come and go, but the barn will remain cozy. Nesting boxes: Plan on 2 or 3 for seven or fewer hens. For a large flock have 1 box for every 5 birds. These can be homemade or purchased. Mount these about about 6 inches off of the ground. If they’re higher than the roosts, then the hens will sleep in them – something that you don’t want them to do. Exterior space: Provide at least 8 square feet per bird for the fenced run. Flooring: You can have anything from dirt to wood to concrete. If you do have a dirt floor, then make sure that you can protect your hens from digging predators and rats with underground fencing. If you have wood, you can add a sheet of inexpensive vinyl to keep it from absorbing moisture and to ease cleaning. I have concrete floors in my coops, which is an initial expense, but makes for secure and clean housing. You’ll also need an area for dust bathing, and a sheltered place, whether inside or out, for the food and water dispensers. You’ll need storage for grain, bedding and tools. I prefer coops and runs that I can walk into for ease of cleaning and also so that I can spend time with my chickens. Don’t be swayed by the ads that tout small starter coops. Buying one will be an expensive mistake, as you’ll need replace it later on. Design and build the right housing from the start and you’ll have a healthy, peaceful, productive flock. If you’re looking for ideas, I have a Pinterest board with examples of small coop designs.